Knowing the proper horse vaccination schedule is essential if you want to keep your horse safe from a number of potentially fatal illnesses. Ask your equine veterinary specialist about these vaccinations: West Niles, strangles, rotavirus A, rhinopneumonitis, rabies, Potomac horse fever, influenza, equine viral arteritis, equine viral encephalomyelitis, influenza, tetanus, and botulism. Knowing and adhering to the right horse vaccination schedule is important because some vaccines need to be given to horses at a specific age in order to provide the best protection. For example, the first West Nile vaccine for horses should be given at 3-4 months of age, a second dose 1 month later, and a third dose six months later in high risk areas. After that, a booster is given twice a year except in places where the risk is high where boosters should be given semi-annually or even quarterly. West Nile is transmitted by mosquitoes. A number of vaccinations should be administered for the first time when the horse is 3 to 4 months old. The horse vaccination schedule may require a second or third dose within a few months. Thereafter, the vaccinations are administered annually. Vaccines are generally given by intramuscular injection. 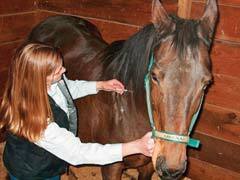 The horse may have some localized irritation or swelling at the injection site. Particularly distressing are equine protozoal myeloencephalitis symptoms which include neurological problems. The horse may have coordination problems, spasticity and weakness. The horse may have difficulty breathing because the airway flaps become paralyzed. The stifle joint may lock up, muscles may atrophy and the horse may appear to be lame. This disease is not transmitted horse to horse, but rather through the feces of another animal. Possums are the most likely intermediate host. Fortunately, vaccinations are now available to prevent Equine protoazoal myeloencephalitis and it should be included in your horse vaccination schedule.